Successfully Added Ultra HD 4K WiFi Sports Action Camera - Waterproof, DV Camcorder, 16MP, 170 Degree Wide Angle, 2 Inch LCD Screen, 1pcs Battery to your Shopping Cart. 4K ULTRA HD ACTION CAMERA: Professional 4K 30FPS/ 2.7K 30FPS /1080P 60fps video with 16MP photos at up to 30 frames per second for incredible photos, which is 4 times the resolution of traditional HD cameras. Capture and share your world in a fantastic resolution. LCD SCREEN: 2 inch high definition back screen that displays and replays good videos recorded.Improved Sony IMX179 sensor with 170 degrees wide angle lens to get more real and more natural pictures, capture the details which human eyes cannot see clearly. 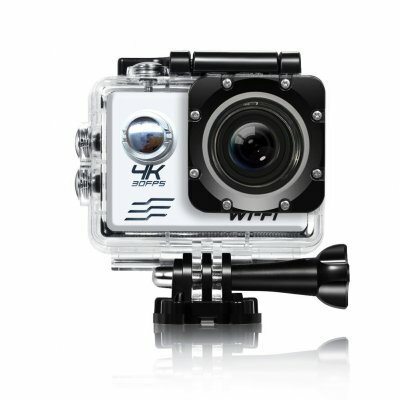 WATERPROOF TO 98 FEET/30 METERS: You can capture amazing videos underwater which is great for diving, swimming and other outdoor activities. BUILT-IN WIFI FUNCTION: Easy to transfer the pictures and videos to your smart phones and tablets. Download the free APP (Final Cam), and take full control of your camera through WIFI function. WHAT YOU CAN GET: 19 accessories with 1pcs battery,12-month warranty. Compare to 1.5 inch display,2 inch HD display makes it easy to capture the world in a lens perspective ensuring nothing will be missed out. You can capture stunning 4K 30 fps/2.7K 30fps/1080P 60fps video that is sharper and more lifelike than ever. With 16MP burst photos at a blistering 30 frames per second,which helps you capture the moments you do not want to miss. Capture single photos,burst photo or choose time lapse mode to shoot photos automatically at set time intervals from 0.5 to 60 seconds. This Video Camera can works normally under 98 Feet water. The capacity of this camera up to 64GB compare the other 32GB action camera.That will let your record more wonderful scenery.